No home is complete without a sofa. They provide comfort and allow family and friends to socialise, unwind and watch television together. With that said, a new sofa is an investment, and buyers want to make sure they get both great comfort and functionality for their money. The technologically and brilliantly designed OSIM uDiva 2 Smart Sofa comes in a sophisticated package that fits perfectly in any desired space. This sleek-looking smart sofa is not just aesthetically pleasing, the uDiva 2 Smart Sofa is fully retractable to offer more living space when not in use, saving more than 34% of living space. Middle: Chia Sook Fun, OSIM’s General Manager. Unlike any conventional sofa, the uDiva 2 Smart Sofa features 8 versatile transformations with something to suit every need and moods. The uDiva 2 Smart Sofa will give user the triple benefits of sofa, massage chair and lounger — all into one nifty package. Sofa: The uDiva 2 Smart Sofa can be comfortable as a sofa, allow users to retreat for some quality ‘me’ time. 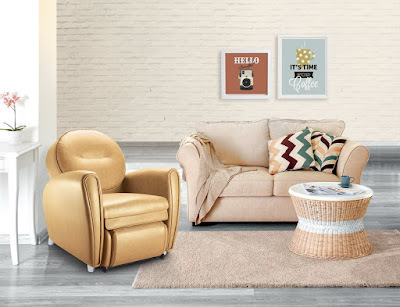 Sofa with ottoman: Pamper yourself at home as you engage in your favourite beauty routine. Leg massage: Provide a complete reflexology session involving calves, ankles and feet that will melt away soreness and pain. Back massage: Dispel back aches with a blissful back massage while you catch up on your social media platforms. Back massage with ottoman: Complete with an ottoman, the uDiva 2 Smart Sofa can help to soothe and reduce back pain as well as promoting a better posture. Upright full massage: Get your muscles massaged to reach maximum relaxing moments while you immerse in your favourite drama. Lounger: A lounger you can lay down comfortably on while you read a book or apply facial mask. Reclined full massage: Drift off to serenity with specially designed massage programmes that soothe you from head-to-toe. On top of that, the uDiva 2 Smart Sofa comes with a sleek controller design that attached with illuminated controller, exquisitely crafted with hidden wires and easy to use even under low light conditions. 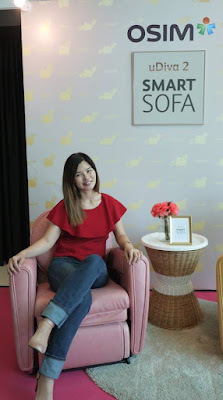 “The OSIM uDiva 2 Smart Sofa is one of a kind smart sofa,” says Chia Sook Fun, OSIM’s General Manager. "Smart sofas are not just seating objects with mechanical functions, they have a bigger purpose. OSIM uDiva 2 Smart Sofa is a great example as it is not just a smart sofa but a combination of the best design, innovative technology, and relaxation there is to offer. The uDiva 2 Smart Sofa is a perfect addition to have in everyone’s living room, bedroom or workplace as it complements any interior design theme, whether it is Modern, Scandinavian, Industrial, Contemporary, Retro or Chic. Available in 4 different colours, user can choose which uDiva 2 Smart Sofa best matches the style of their space. Can I have one too, please?! In conjunction with this Mother’s Day, it is time for us to send our mother a smart sofa that is able to relieve their fatigue and be used as a comfortable sofa when she rest. The uDiva 2 Smart Sofa is sophisticatedly designed and topped with outstanding feature. It is a gift she will never forget! uDiva 2 Smart Sofa is retail at RM 8,988. Launching price @ RM 7,388 with up to 24 months instalment, only RM 308 per month. This promo is valid till 15 April 2018.